Work stalled on the Filene’s project in 2008 as the economy sputtered, leaving a crater at the construction site. In downtown Boston, it is simply known as the hole. 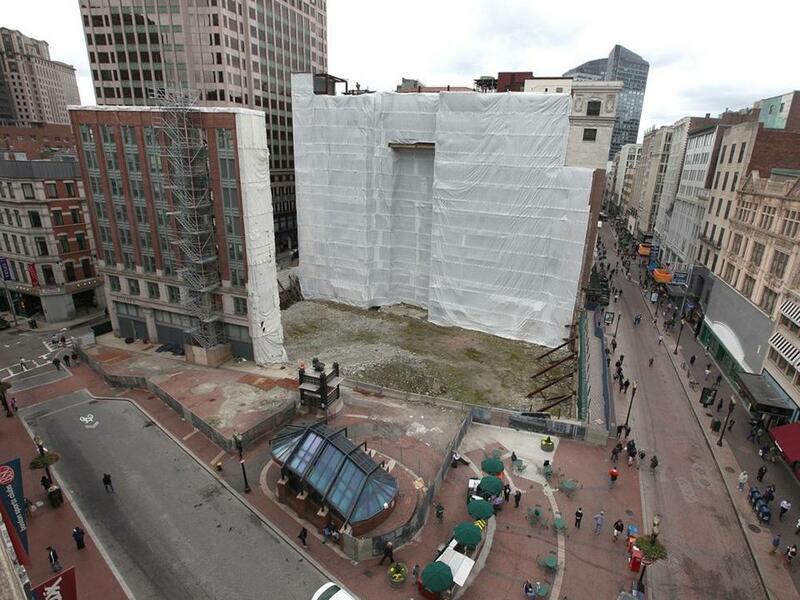 The former Filene’s property, with a construction crater two stories deep, has been a scourge on the city’s central shopping area for five years, defying the wave of recovery that has sprayed the city with new towers and renovated buildings. But now its developer has a real sign of progress — an emerging deal with a promising tenant that will enable construction to resume on the $620 million project as early as April. The advertising firm Arnold Worldwide is negotiating a lease to occupy most of the original Filene’s department store, a commitment that in turn would unlock funding for construction, according to a person with knowledge of the transaction. This individual was not ­authorized to speak publicly because the deal is not yet final. More than any other project, the Filene’s redevelopment is crucial to the broader campaign of revitalizing downtown Boston and its shopping district. Positioned at the center of Downtown Crossing, it would bring an influx of new residents and stores to an area that has just begun to shrug off a reputation as a ­second-rate retail destination. The redevelopment of the Filene’s block would proceed in phases. The first is the renovation of the original Filene’s store into an office and retail complex, to be followed months later by construction of a 625-foot tower over the site of the crater, with residences and ­additional stores. Due to its size and marquee location, the project is enormously complex in terms of financing and logistics, requiring the developers to break it into phases. An executive leading the project for developer Millennium Partners could not be reached for comment Tuesday. Executives with Arnold Worldwide also could not be reached, and a spokesperson for its real estate representative, Cassidy Turley, declined to comment. Now in the Back Bay at 101 Huntington Ave., Arnold Worldwide would occupy about 125,000 square feet in the historic Filene’s building, said the person with knowledge of the deal. That lease would then generate private funding to ­finance construction. The Filene’s store was the last major building by renowned architect Daniel Burnham, who died before its opening in 1912. The building is now gutted and missing a wall. But Millennium Partners plans to restore many architectural details, including its metal and glass canopies and its distinctive wall of glass along Washington and Summer streets. In his state of the city address last night, Mayor Thomas M. Menino trumpeted the progress rippling through downtown Boston, citing the construction of hundreds of new residences in the area, including a separate luxury condo project by Millennium Partners across from the Ritz-Carlton on Washington Street. “Condos are selling out in Downtown Crossing, of all places,” Menino said. He added that collectively developers broke ground on more than $1.6 billion worth of projects in the city last year, with high rises sprouting from the Seaport District to the Fenway. Three of those are just a few blocks from the Filene’s site: the 256 condos at Millennium Place; a 381-unit apartment tower by Kensington Investment Co. on Washington Street; and a third tower at the edge of the Rose Fitzgerald Kennedy Greenway in Chinatown. The burst of development, which also has brought new retailers to the area, has occurred despite the crater at Filene’s. 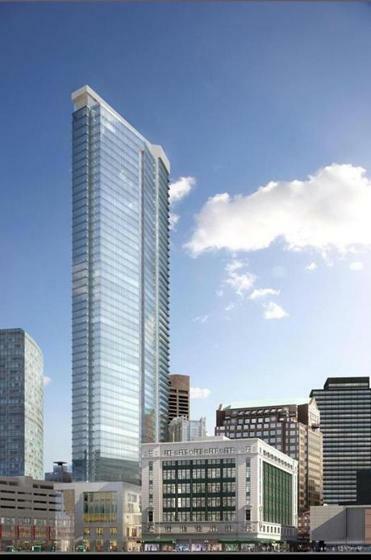 Developers plan to build a tower at the Filene’s site in Downtown Crossing. Construction on the property stalled in 2008, as a deepening recession dried up funding for the project. The developers — a team that included Vornado Realty Trust and Boston developer John B. Hynes III — spent years trying to resurrect the development. The city eventually pulled the project’s permit amid a war of words with the developers. Last year, Millennium Partners took over the effort, revamped the development plans, and won approval for 1.2 million square feet of commercial and residential space in two buildings. The main element of the project is a slender glass tower that will contain between 500 and 600 residences and likely become a new focal point on the city’s skyline. While the crater — or the tower over it — has captured most of the attention on the project, the developers have paid equal attention to the restoration of the original Filene’s store, spending the last several months working on designs and trying to find a tenant. The deal with Arnold Worldwide has just begun to firm up in recent weeks. The person with knowledge of the deal said Arnold is interested in occupying the top four floors of the building. The lower floors would contain new stores, and Millennium Partners is exploring getting a grocery store to serve residents moving to the area. No retail tenants have been signed. The project would also result in the renovation of a park that would get a new ­MBTA station entrance and an amphitheater. It remains unclear when that work would begin.